deceased Ebola-infected monkeys, scientists determined the virus can stay alive for up to 7 days in a dead victim. They also found that non-infectious viral genetic material can remain for up to 70 days after death. 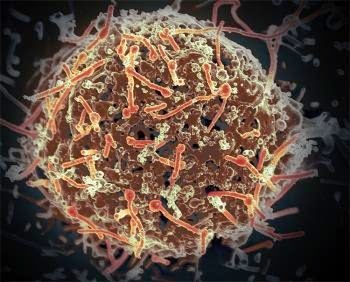 The researchers - from the National Institute of Allergy and Infectious Diseases (NIAID), a part of the National Institutes of Health (NIH) - report their findings in the journal Emerging Infectious Diseases. They say the study shows it is possible to catch Ebola from dead victims of the disease for several days after death and confirms the importance of safe handling and burial of their bodies. has died of Ebola than riskier procedures, such as tissue biopsy. virus infection when they died - presumably from other causes. spread of the disease but also to decide whether it is necessary to trace the people they may have been in contact with. after showing signs of disease. They put the bodies in a chamber that simulated the environmental conditions in West Africa - the location of the current outbreak, which is thought to be the worst in the history of the disease. surfaces and four internal organs. swabs for up to 7 days and in tissue samples of internal organs for up to 3 days after death. The team also found viral RNA in several swab and tissue types up to 10 weeks after death. outbreak, it is customary for members of a dead person's family or community to be involved in the washing and handling of the body in preparation for burial. When the body belongs to a victim of Ebola, this religious and cultural tradition can unfortunately help spread the disease. An important element in the control of the outbreak is deciding how best to intervene in this practice without undermining the traditions and needs of the bereaved and losing the trust and cooperation of communities. In November 2014, Medical News Today reported a new WHO protocol on safe and dignified burials of people who have died from suspected or confirmed Ebola virus disease. The procedures include meaningful and safe alternatives for touching and bathing the deceased.